(Toledo, OH) The late evening sun popped out from behind my garage, and my Puggle Eddie Haskell basked for a few moments in the fading light. The image came out with some bluish hues from the sharp contrast between the sunny foreground and the heavily shaded grass, but I liked the overall effect. There is almost a three-dimensional quality to the image, and Eddie's head sort of jumps off the screen at the viewer. Especially if the viewer is stoned, but even for us sober folks. A Puggle is a relatively new hybrid dog breed produced by mating a small female Beagle with a select male Pug. 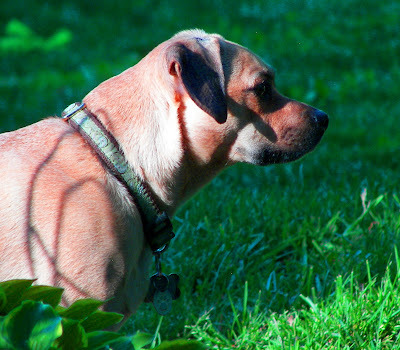 Puggle are the most popular designer dog breed. Puggle are for cuddles. The hot designer dog of the decade.